Opening in 2017, this beachside restaurant focuses on fresh seafood and Mediterranean dishes with “hints” of Arabic flavours. 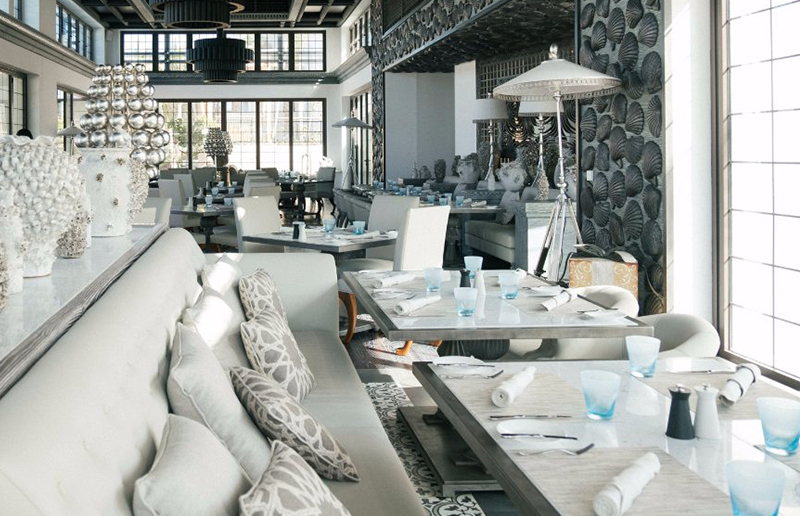 Inside, the restaurant is decked out in a white, silver and stone colour scheme, with floor to ceiling windows opening out on to a decking area and some of the best views of the Burj Al Arab in the city. Although there are meat and vegetarian options available, the focus at this restaurant is very much on fresh seafood. For starter, there’s a range of raw seafood options available. The Tasmanian salmon with celeriac and lemon caviar, and the sea bass with pickled carrot, avocado and lime dressing. If raw seafood isn’t your jam, there are cooked soup and salad options available too. For mains, the seafood mix grill is worth a try (served with tiger prawns, scallops, calamari, pomfret, mussels, fennel confit and lemon butter sauce) as is the signature ‘rockfish’ dish, and the delicious linguini seafood, served with freshly made pasta in a white lemon sauce. For dessert, there’s plenty of standard European fare, (think pannacotta, parfait and cheesecake). Our favourite was the white chocolate sabayon, served with fresh berries and pepper strawberry ice cream. When BBC Good Food Middle East visited the restaurant, it was near to full capacity and service was initially a little slow. However, once the food order had been taken, food was served quickly and drinks regularly topped up. This one is worth visiting when its cool enough to sit outside. The restaurant has spectacular sunset views, with some of the best views of the Burj Al Arab in the city. Expect laidback beach chic, with a mix of expats and tourists. Details: around AED 500 for two people with no alcohol. For more information, visit Rockfish. If you enjoyed this article, you might like these reviews.